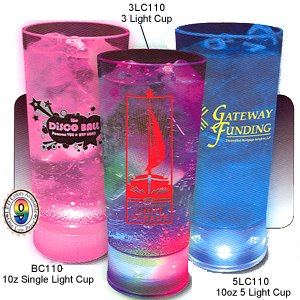 These Light-Up Plastic Pints and Cups are perfect for bars, restaurants, clubs, fraternities, sororities, promotions, and much more. Customized Blinking/Light-Up Glasses add a unique and fun touch to any event. Many glass colors in six sizes (10-60 oz.) and over two-dozen imprint colors are available. 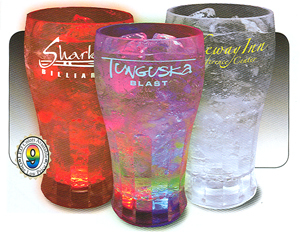 Our Light-Up Plastic Pints and Cups are made in the USA of durable acrylic and heavy plastic to ensure long use. Your satisfaction is guaranteed when you order custom glassware from us. BC110 10 oz. Blinking Cup 3.55 3.39 3.29 3.05 2.96 2.85 2½" 2½"
3LC110 10 oz. 3-Light Cup 3.85 3.65 3.45 3.35 3.25 3.14 2½" 2½"
5LC110 10 oz. 5 White Light Cup 3.95 3.75 3.55 3.45 3.35 3.23 2½" 2½"
BS112 12 oz. 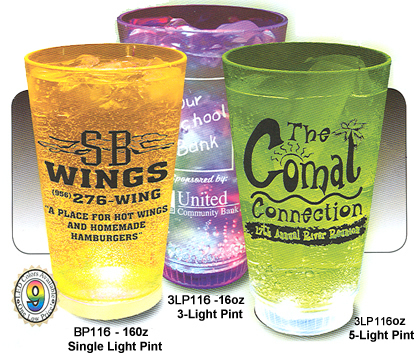 Single Light Soda Cup 3.99 3.89 3.69 3.55 3.45 3.05 2¼" 1¼"
3LS112 12 oz. 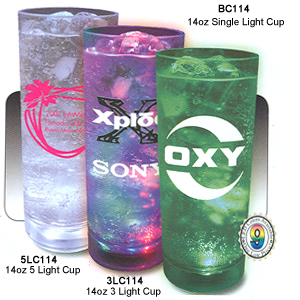 3-Light Soda Cup 4.09 3.99 3.79 3.65 3.53 3.15 2¼" 1¼"
5LS112 12 oz. 5 White Light Soda Cup 4.19 4.09 3.89 3.75 3.60 3.25 2¼" 1¼"
BC112 12 oz. Blinking Cup 3.60 3.44 3.34 3.10 3.04 2.90 3" 3"
3LC112 12 oz. 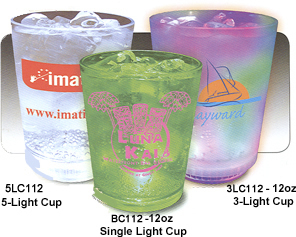 3-Light Cup 3.85 3.65 3.45 3.35 3.25 3.14 3" 3"
5LC112 12 oz. 5 White Light Cup 3.95 3.75 3.55 3.45 3.35 3.23 3" 3"
BC114 14 oz. Blinking Cup 3.60 3.44 3.34 3.10 3.04 2.90 3½" 4"
3LC114 14 oz. 3-Light Cup 3.85 3.65 3.45 3.35 3.25 3.14 3½" 4"
5LC114 14 oz. 5-Light Cup 3.95 3.75 3.55 3.45 3.35 3.23 3½" 4"
BP116 16 oz. Blinking Cup 3.89 3.69 3.47 3.37 3.27 3.15 3" 3"
3LP116 16 oz. 3-Lighted Pint 4.35 3.99 3.79 3.69 3.57 3.47 3" 3"
5LP116 16 oz. 5-Lighted Pint 4.45 4.09 3.89 3.79 3.67 3.57 3" 3"
BC120 20 oz. Blinking Cup 3.89 3.69 3.57 3.45 3.35 3.29 3" 3"
3LC120 20 oz. 3-Light Cup 4.28 3.93 3.73 3.69 3.59 3.53 3" 3"
5LC120 20 oz. 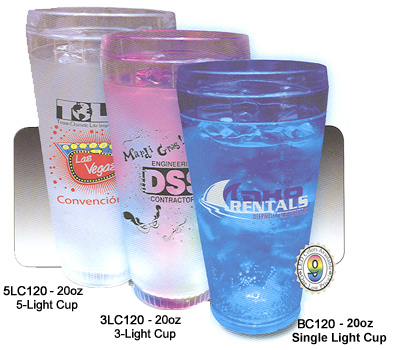 5-Light Cup 4.33 4.03 3.87 3.79 3.79 3.63 3" 3"
It's easy to get started with your Custom Glasses - simply call 1-800-233-0828, and then e-mail your camera-ready artwork to graphics@kardwell.com (you can also mail your design). Production time is about three weeks. Rush delivery is available for an additional charge.